The weather is cooling down and my skin started to dry. Typically I have dry to combination skin that changes throughout the year. In the summer I tend to be a touch oily through my T-zone and in the winter, my face, also body tends to get really dry. My dry skin absolutely loves moisture, such weather. I don’t like heavy creams and lotions on my face, but I do like a lot of moisture, so I’ve taken to layering Boroline on the face and then apply my daily moisturizer. It’s seemed to work very well! Beauty Hack #1: Due to the cold and household works my hands become drier . I have to try to keep them as moisturized and soft as I can. First, I do scrub on my hands with 2 simple kitchen ingredients, sugar and olive oil. You can add some lemon juice in it too if you feel your hands are getting darker and then keep massaging till sugar get dissolved completely and then wash it off with warm water. Just after this I have applied Boroline and leave it for overnight. The next morning I wake up with very soft, smooth hands. Beauty Hack #2: The season change can cause both nails and cuticles to get dehydrated, which means your nails are more likely to split, break with hangnails. With a little extra care, we can keep our nails strong and healthy. Just massaging the Boroline on every nail gently at night time, it prevents dryness-induced breakage. If your nails lost their shine, even nails will get their shine back. *Try to keep your nails shorter and more rounded so that they won’t break as easily. Beauty Hack #3: Boroline is great for your lips. It helps to get rid of the dry, chapped lips into moisturized lips overnight. Apply a very ample layer of the Boroline on lips with a very gently rub. Next morning you can see the miracle. Beauty Hack #4: Often in winter my heels will crack. I’ve tried many different creams. Where other creams help but Boroline truly does the best job. For quick results put a good amount of Boroline on a spoon, warming up it and apply it in the molten state on crack heels at night and sleep with cotton socks. Follow this method as needed to prevent and repair dry, cracked heels! it's work remarkable. Beauty Hack #5: Boroline acts as an antiseptic as well as a night cream for dry skin and can help protect and heal windburn in winter. Beauty Hack #6: After shaving skin lost its moisture and it causes dry, rough and itchy skin. So just after shaving, I apply some Boroline on the area and its back to its natural moisture. Beauty Hack #7: I’m not a huge makeup girl. But I just use a tiny amount of Boroline for remove matte lipstick or even waterproof mascara. 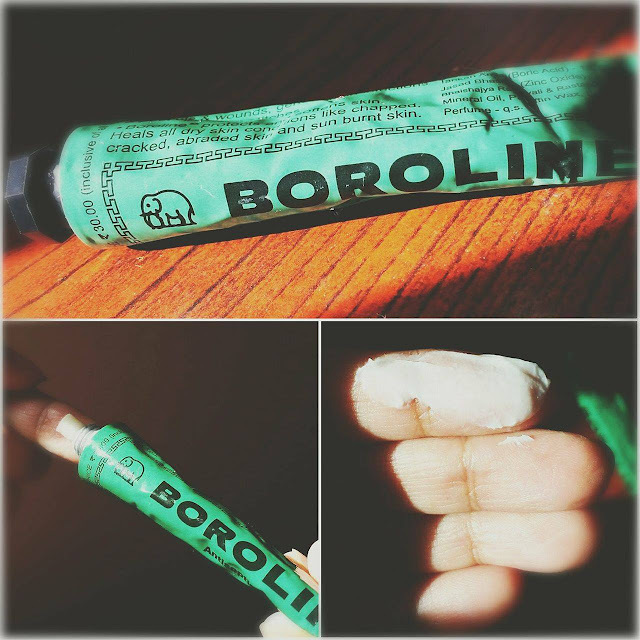 Beauty Hack #8: Anytime my hands or heels get dry and chapped I rub a little amount of Boroline on them. Beauty Hack #9: Boroline is also great for blackhead. First, steam your nose so that the pores may get open. Then apply a layer of Boroline on your nose and gently massage for 5 minutes. Leave it for 2 minutes. Boroline makes skin soft and loosens pores which making it easier to remove them. Now with the help of blackhead extractor, you can easily remove the blackhead. After that wash your nose with lukewarm water. It is the best remedy to remove blackheads overnight effectively, so must try it. And last but not least, a tiny amount of Boroline on your elbows and knees will keep them from getting dry. I always use Boroline at night time or just before bed because I don’t like the sticky feeling (Boroline has thick, sticky texture) on my face while doing my everyday work at day time. For its heavy and sticky texture dirt , dust, and other impurities could stick on your face so easily. I recommend doing this before bed. I hope this post will help you. Actually Boroline makes skin soft then with help of blackhead extractor it is easy to remove blackhead :) so must try . Boroline is really good product. Nice post. Liked it.